If you’re not aware of Aam Aadmi Party’s activities in Delhi – there’s a good chance that you’ve a wrong impression about them. AAP members and their convener have become thick skinned being called names and being arrested and beaten by the police on the behest of national parties. Media has a wildly known gag-order to report their activities. Crores of party funds are being spent on social media to challenge the growing following of AAP among the young. Editorials are written by big names to call these people anarchists. If you don’t follow politics you may sometimes not understand their actions either. How many evenings have we spent wondering “Is desh ka kuchh nahi ho sakta?” The hopelessness about the system is so rampant, that nobody is untouched from it. 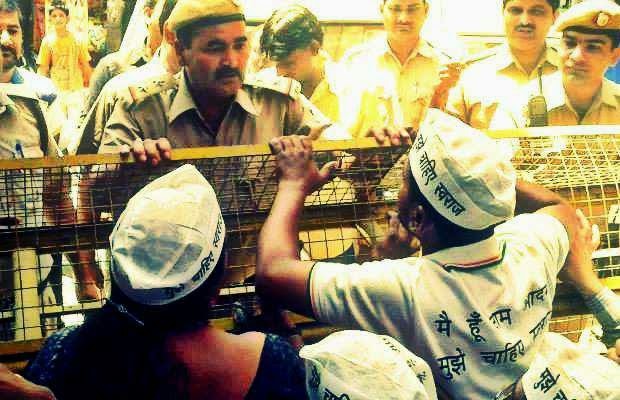 If I have to define AAP’s unconventional methods of fasting, disobedience, gherao – I can simply say that this passionate group of people is trying to find the answers to the hopelessness. It won’t be overstatement to say whatever success they’ve achieved so far – AAP is the only ray of hope for Indian politics today. As they believe, systems need to be shaken up so they fall in line – else the status quo will continue. Police guarding people’s representatives from people. Ironic? As citizens we had bid adieu to the expectation of accountability long ago. Same reason why ombudsman bill (lokpal) which should have been a major pillar of our democracy wasn’t even looked at for so many years. IAC and AAP have tried shaming the government several times into taking action against corruption – but seems they’re even more thick skinned. Both the major parties have mastered the art of manipulating opinions during elections on identity politics. Real issues of common man never even come into the picture. AAP has overtime realised that before the leadership can change, the voters need to be woken up. All the methods of fasting, civil-disobedience, gherao are methods to jolt people awake into taking action. During Bijli-Paani rally many critiques asked that why should people not pay the bills when they use the services. They asked why Kejriwal and party are asking people to break the law. This was after exposing the open corruption by Delhi government in raising electricity bills to make profit for discoms. It can be explained through simple logic – when you don’t like Idea services on your mobile, you have the option to change to Airtel, or Tata. As a consumer of electricity, do you have that option? Like Roti, Kapda and Makaan – electricity is a basic need – how does an elected government get away from selling the interest of people by compromising something so basic. An unjust law is no law and it needs to be protested against. When there’s no system of accountability in place – there’s no option but to come on roads and protest. When your local MLA comes and begs for your votes – you should ask – do you even have the right to approach him post-elections to ask if he fulfilled his promises? MLA Gherao protest isn’t about creating chaos and making noise. It’s a simple assertion of your basic right to meet and ask your elected representative that what has he done about those promises? Don’t they all say in speeches that “Hum Janta Ko Jawab Denge?” (That we answer to the people). The big question is that why do they beat the same people to pulp when they come to meet them? What kind of democracy is this – and whose representatives are these people? You may not join AAP protests personally – but as a voter you should understand that while your leaders are sipping tea in their AC rooms, these people are on roads, in 44 degree Celsius fighting for your rights. It may appear noise to you – but voting and voting for the right people is something you owe to your future.